The new Mercedes-AMG GLC 43 4MATIC Coupé has just seen the light of day. The SUV coupe comes with its unmistakable design, as the high-end fusion of sporty character and elegance, a combination that turns it into a thoroughbred performance car. 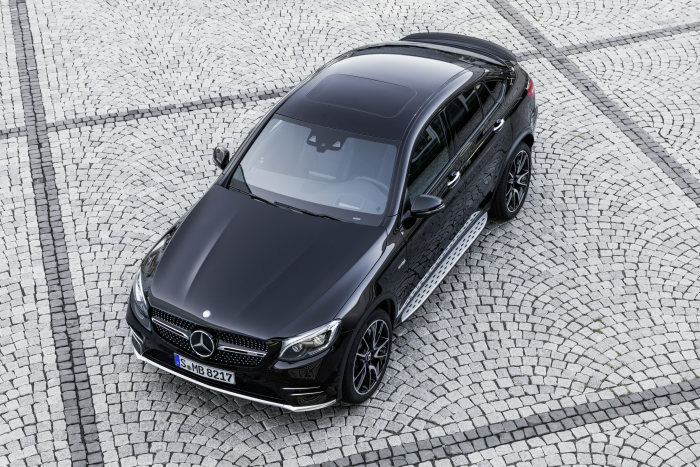 Powered by the 3.0-liter V6 biturbo, developing 367 HP and a 520-Nm maximum torque, the GLC 43 4MATIC Coupé runs from a standstill to 100 km/h in 4.9 seconds on the way to its top speed electronically limited at 250 km/h. The new GLC 43 4MATIC Coupé is equipped with the 9G-TRONIC automatic transmission, retuned for a more dynamic driving experience. The AMG engineers have managed to reduce the shift times of the 9-speed transmission by dedicated software application. “Manual” mode can be selected using a separate button in the center console. The gear changes are based on the selected transmission mode, with the driver able to shift gears using the standard-fit shift paddles on the steering wheel. For extra agility, neutral cornering behavior and higher traction even when driving at speed, the developers in Affalterbach have designed a dedicated sports suspension based on the AIR BODY CONTROL air suspension system. 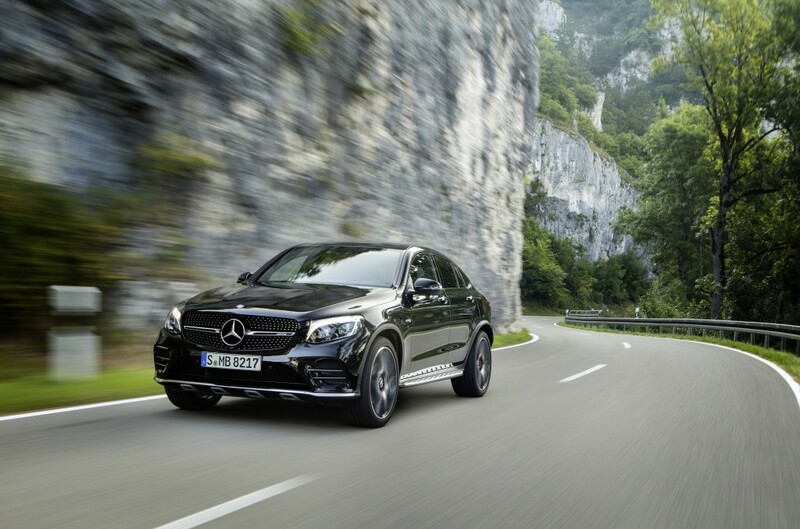 With the AIR BODY CONTROL suspension, the GLC 43 4MATIC Coupé stays confident even off the paved road, as the vehicle level can be increased at the touch of a button, giving it more ground clearance, even while on the move. The SUV Coupe sports a fording depth of 300 mm, an approach angle of 19.8 degrees and a departure angle of 20.8 degrees. 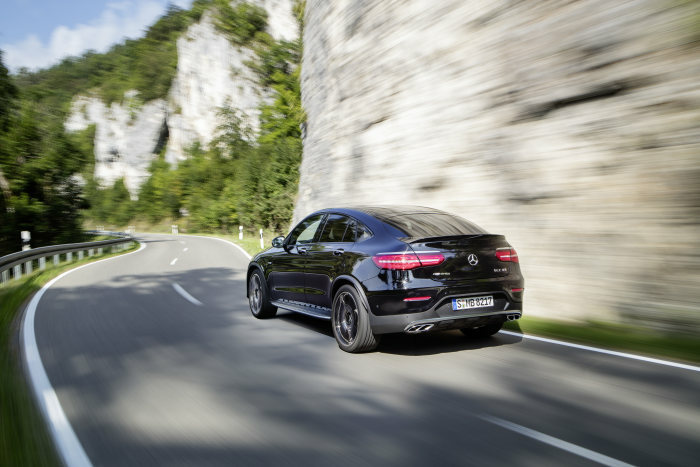 The standard-fit AMG Performance 4MATIC all-wheel drive system features a rear-biased torque distribution of 31 percent to the front axle and 69 percent to the rear axle, providing better vehicle dynamics and higher lateral acceleration on the road, but also improved traction. The personality of the Mercedes GLC 43 4MATIC Coupé can be tailored according to the driver’s preferences, switching from Eco to Comfort, Sport, Sport Plus or Individual. A single tap of a finger modifies key parameters, such as the response of the engine, transmission, suspension and steering. The DYNAMIC SELECT transmission modes “Sport” and “Sport Plus” are even more strongly configured for driving dynamics in the GLC 43 4MATIC Coupé than in the series-production models. The “Eco” increases efficiency and reduces fuel consumption via its ECO start/stop function and the gliding function: when the driver releases the accelerator in a speed range between 60 and 160 km/h, the clutch is disengaged and the engine is decoupled from the powertrain. Assistance systems such as Active Brake Assist, Crosswind Assist, Headlamp Assist, ATTENTION ASSIST or ESP® Curve Dynamic Assist enhance on-board safety as standard. Additional driver assistance systems can be added for further comfort and safety. 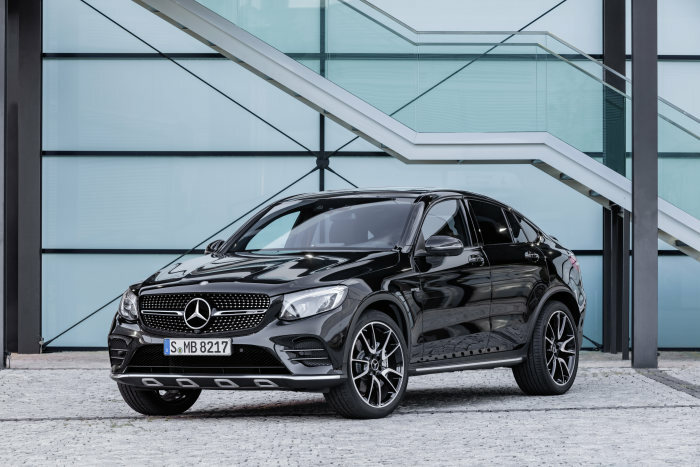 A diamond radiator grille with chrome pins and a louvre in high-gloss black with insert in high-gloss chrome and AMG lettering in high-gloss chrome highlight the front view of the SUV Coupe. The sporty distinctive air intakes in the AMG front apron feature fins in silver chrome. 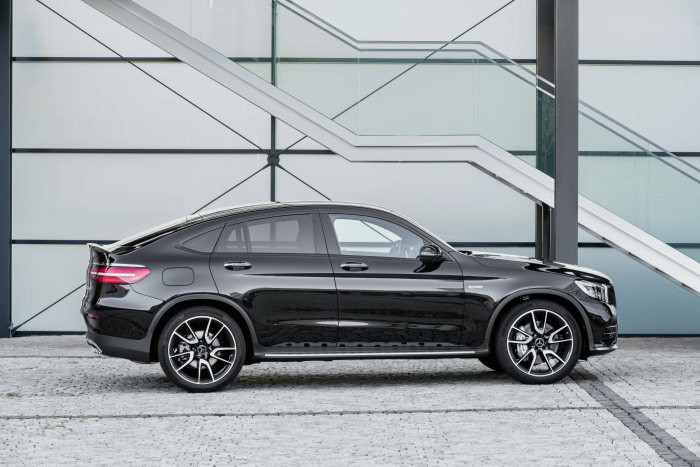 Apart from its standard sibling, the GLC 43 4MATIC Coupe comes with an A-pillar with a flatter slope angle, as the greenhouse blends in with the side of the vehicle to emphasize the specific coupé silhouette. Wide shoulders point out the muscular proportions and the dynamic looks of the GLC Coupé. The tail end exudes sporty, aesthetic appeal. Chrome-plated tailpipes and narrow taillights, together with a sharp spoiler lip recall the design line displayed for the first time in the S-Class Coupé. 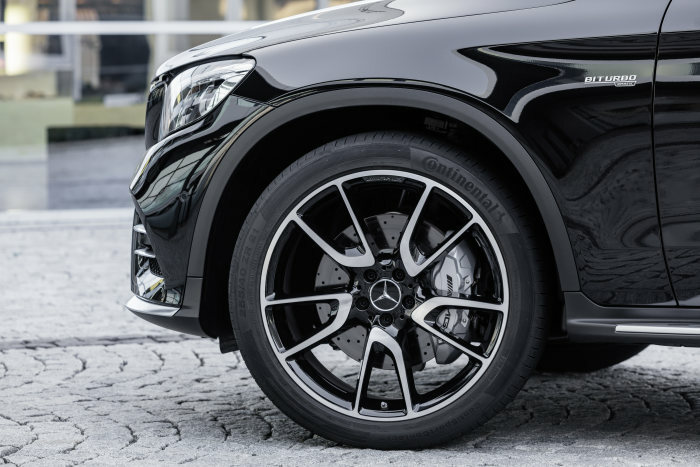 The GLC Coupe rolls on high-gloss black-painted, high-sheen 48.3 cm (19-inch) AMG 5-twin-spoke light-alloy wheels, wrapped in mixed-size rubber in the dimensions 235/55 R 19 on 8.0 J x 19 at the front axle and 255/50 R 19 on 9.0 J x 19 at the rear axle. Other combinations, design and sizes up to 21 inches are optionally available. The interior of the SUV Coupe brings a contrasting combination of red and black. The multifunction sports steering wheel in black leather with red contrasting topstitching features a flattened bottom section, perfectly designed for an emphatic driving style, dictated by the sports seats with improved lateral support, covered in black ARTICO man-made leather/DINAMICA microfiber with red topstitching. Two large round dials in a chequred-flag design and 5.5-inch central color multifunction display make up the AMG instrument cluster. Customers with a passion for motorsports will be pleased to note the RACE TIMER for recording lap times on closed-off tracks. The GLC 43 4MATIC Coupé is standardly fit with the Audio 20 CD with 7-inch (17.8 cm) display, Frontbass, Bluetooth® hands-free function, audio streaming and two USB ports. The optional Garmin® MAP PILOT with Live Traffic expands Audio 20 CD into a fully-fledged navigation system with traffic jam avoidance integrated into the onboard electrical system. There is also the option of fitting it with the COMAND Online, that comes with a 8.4-inch screen. It also allows optional digital TV/radio reception. The interior of the GLC 43 4MATIC Coupé can convert into a concert hall with the optional Burmester® surround sound system, which includes 13 speakers and a system output of 590 watts. The sporty SUV is a leader in its class even when it comes to loading capacity: the luggage compartment features a capacity ranging between 491 to 1400 liters. The newly presented Mercedes-AMG GLC 43 4MATIC Coupé will have its first public display on September 28th, at the Paris Motor Show and will hit the showrooms just in time for Christmas.